What makes Eagle Eye Outfitters special? To sum up what makes Eagle Eye Outfitters special is these three words - people matter most. 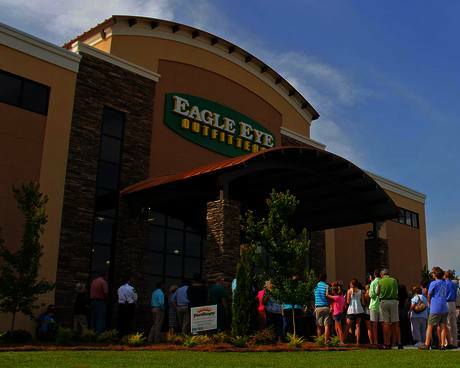 Eagle Eye Outfitters is dedicated to serving our customers, staff, and community. People are valuable, and it is our job to invest in them. One of our core values and driving factors behind who we are as a company, like I mentioned above, is this: people matter most. We put a huge emphasis on this through investing in our customers, our staff, and our community. That is what we like to call our "Circle of Service". We desire to cultivate genuine relationships with each customer, far beyond just transactions. We desire to invest in all of our staff members, as well as their families. We desire to serve in the community and do our best to meet the needs of everyone we encounter. Mark and Susan laid the foundation for EEO with this principle in 1999, and nineteen years later, this is still a driving factor behind the way our company operates. We also have a VTO (Volunteer Time Off) Program for our employees. This allows for employees to be paid, per usual, to serve in the community. We currently serve with over 20 different organizations throughout our community. VTO is truly an amazing experience. It definitely has opened my eyes to the various needs in our community. In addition to VTO, 2% of our daily sales go back into helping our community and other local ministries in our area. We certainly could not have done any of this without God. His faithfulness and countless blessings have far exceeded anything that we could have ever imagined. He gets all the praise! We also would not be where we are today without our wonderful customers.